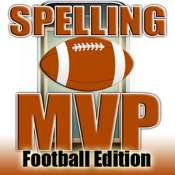 Spelling MVP for iPhone is a spelling game that combines your passion for football with the fun of a Spelling Bee. But, don't confuse this game with a traditional Spelling Bee. The goal of this game is to get 70 words correct and adding your name to The Spelling Wall of Fame as an MVP. For every word, each participant gets 30 seconds to get the correct spelling. But, don't answer before you're certain, because a correct answer following a wrong answer will not move you closer to MVP status. Wrong answers are met with helmet smashing tackles. After the word is pronounced, players will be allowed to hear the word used in a sentence. Spelling MVP has two modes - One that uses football phrases and jargon plus one that uses traditional spelling bee words. Both modes can lead to the Wall of Fame and are equally challenging. If you think you're ready for this challenge, Spelling MVP is available in the iTunes App Store.